Lynnville-Sully held its first Family Early Literacy Night on Monday, Dec. 12, and welcomed 24 families for a night of fun and hands-on literacy learning. At the event, Mrs. Teri Bowlin, preK-8 principal, explained how the parents and children completed 12 activities focusing on phonics, phonemic awareness, sight words, read aloud, writing, and fine motor skills. Each family went home with a bag filled with various resources to use to replicate the school’s activities along with materials for suggested activities to promote early literacy skills. During the evening, families enjoyed a short snack break, and children also were able to choose a book to take home. 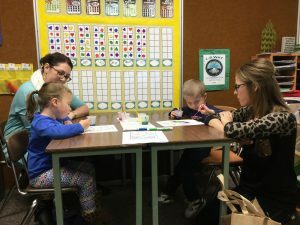 Denise and Katie Staecker, on the left, and Jay and Rebecca Rozendaal participate in a painting activity geared toward helping the children develop control of hand muscles, making writing easier. The successful night was due in part to the team effort of Lynnville-Sully staff and community donors. “It was definitely a team effort to pull everything together,” said Bowlin. Twenty-four staff members contributed to the evening, and Bowlin wishes to thank four area businesses who supported the school’s efforts to promote early literacy – Key Cooperative, Conover Seed, Newton Hy-Vee, and Iowa’s Best Burger Cafe. 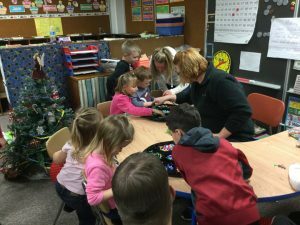 Lynnville-Sully associate Grace Vander Weerdt helps children work on fine motor skills by making bracelets with beads and pipe cleaners.